Translated to the Square of Foreign Missions, this was first laid out in 1939, and within it you can find a bust of Chateaubriand along with a childrens playground, pretty flowerbeds, different trees and plenty of park benches. The Square des Missions Etrangeres translates to the Square of Foreign Missions in English and takes its name from the chapel and building virtually opposite on the Rue du Bac, which belongs to the Societe des Missions Etrangeres de Paris. And this organisation, founded by Alexandre de Rhodes back in the 1600s, is a Catholic Missionary organisation, which is run by secular priests and lay persons who are dedicated to providing missionary work in foreign countries, yet the square itself was only laid out in the 1930s. This garden style square in Paris has beautiful flowerbeds with numerous different types of plants, flowers and bushes, plus there are trees including horse chestnut, poplar and black locust, along with two Japanese cherry trees. Yet as you enter the Square des Missions Etrangeres via the Rue du Bac entrance, one of the first things you will no doubt notice, is a bust statue that was sculpted by the artist Gambier in 1948 and portrays Francois-Rene, Comte de Chateaubriand. 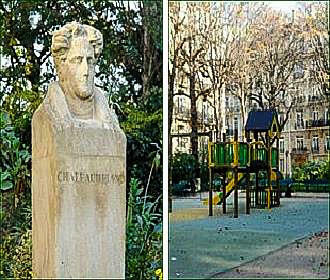 And the reason that you will see the bust of Chateaubriand located here, is due to the fact that this writer, who is often referred to as one of the founders of Romanticism in French literature, spent his final years residing in a property on the Rue du Bac, which is where he died in 1848. But in addition to these features, there is a high wall that was painted in 1995 by the artist Patrice Chanton, that depicts the chestnut trees, which provide shade within the garden, and there are plenty of park benches dotted around for those moments of relaxation, or to rest your weary feet. There is also a large shelter, almost like a gazebo that is covered with ivy, which is often utilised by parents watching their children in the playground to the front of this, and behind this there is a sandbox along with other items for younger children. Plus you can find a water point located within the Square des Missions Etrangeres, which is ideal for topping up water bottles on a hot summers day. You will find the Square des Missions Etrangeres located in the 7th Arrondissement close to many different tourist attractions in Paris including the Musee Maillol and the Hotel Matignon, which is home to the French Prime Minister. There are actually two different entrances to this square, one on the Rue de Commaille and the other on the Rue du Bac, plus it is fully accessible to the disabled, and it opens at 9am on weekends and 9.30am during weekdays plus on National French holidays. However, the closing times vary depending upon the time of year from as early as 5pm during winter, through to 8.30pm in the height of summer. So, when it comes to getting to the Square des Missions Etrangeres via public transport in Paris, the nearest Metro station is the Sevres - Babylone stop serving lines 10 and 12, however, the bus numbers 39, 68, 70 and 94 will also get you close by, plus there is a Velib station for the self service bike hire scheme located on the Boulevard Raspail.